AFA (Art for Awareness) is a newly formed theatre collective in Peterborough looking to raise awareness of important social issues through theatre, dance and performance. Their first performance certainly isn't pulling any punches, and will leave you quite emotional. They are performing the rock opera Next to Normal, based on the Tony Award and Pulitzer Prize winning musical. Filled with adult themes, language and believable situations, you catch a behind-the-scenes glimpse into a family being torn apart by mental issues. The rippling effect of drugs (both poorly prescribed, and recreational), broken communication and the stresses of life are shown throughout the family—which are beautifully portrayed by Marsala Lukianchuk (as the wife, Diana Goodman), Geoff Bemrose (as the husband, Dan Goodman), Mike Rodin (as the son, Gabriel "Gabe" Goodman), Kristyn Russelle (as the daughter, Natalie Goodman), Lucas Deluca (as the boyfriend Henry) and Beau Dixon (as Dr. Fine/Dr. Madden). 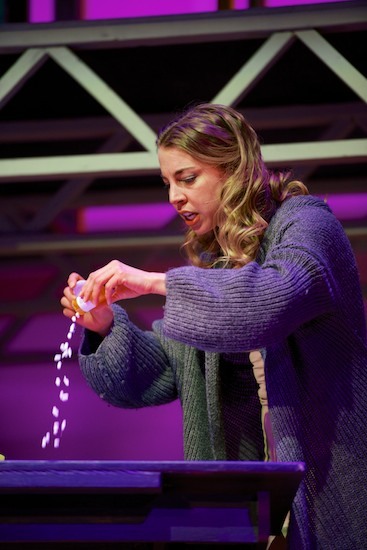 Next To Normal shares with us the turmoil in this family's life through song, and Marsala's portrayal of the wife was outstanding. She genuinely portrays the "lost" feeling that someone in that position must sense. Some musical numbers include the entire cast, with a powerhouse of song, backed up by live music. Great use of digital projection (by Sarah Tye) helped transport the characters between the locals of home, work, doctor's office and school, all the while making use of the multi-platform stage (designed by Ian Burns and constructed by Justin Boyd). Stage direction (by Lindsay Unterlander) was smooth as multiple groups were acting simultaneously, drawing similarities between the two age groups. Next to Normal is directed by Brian MacDonald, choreographed by Rachel Bemrose and musical direction by Justin Hiscox. Follow Art for Awareness on Facebook and Twitter. Tickets for their shows are $20 for adults and $15 for children, and are available at Maar's Music, Black Honey, Antoinette's Bridal Shop and at the door. Next to Normal will be performed at Adam Scott CVI Auditorium at 7:30 p.m. on April 12th, 13th, 17th, 18th, 19th and 20th.